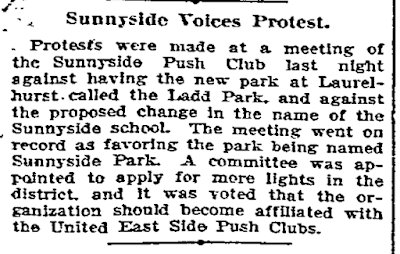 Protests were made at a meeting of the Sunnyside Push Club last night against having the new park at Laurelhurst called the Ladd Park, and against the proposed change in the name of the Sunnyside school. The meeting went on record as favoring the park being named Sunnyside Park. A committee was appointed to apply for more lights in the district, and it was voted that the organization should become affiliated with the United East Side Push Clubs. 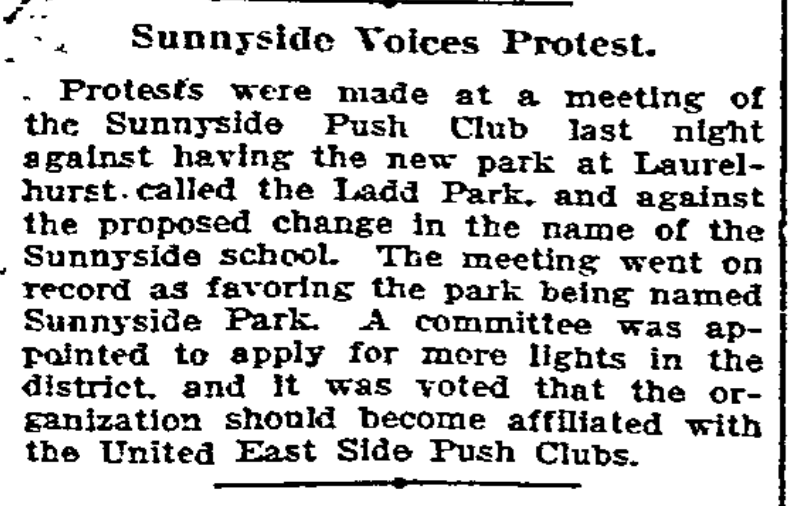 Secretary Walker, of the Sunnyside Push Club, has filed protests with the Board of Education and the Park Board against changing the name of Sunnyside School and against naming the new park the Ladd Park. He also protested to Councilman Kubli against the Laurelhurst plat. The protest against naming Sunnyside School after a pioneer is in anticipation of action the Board of Education may take, nothing yet having been done toward any change. A resolution was adopted by the club against naming the pleasure ground Ladd Park. 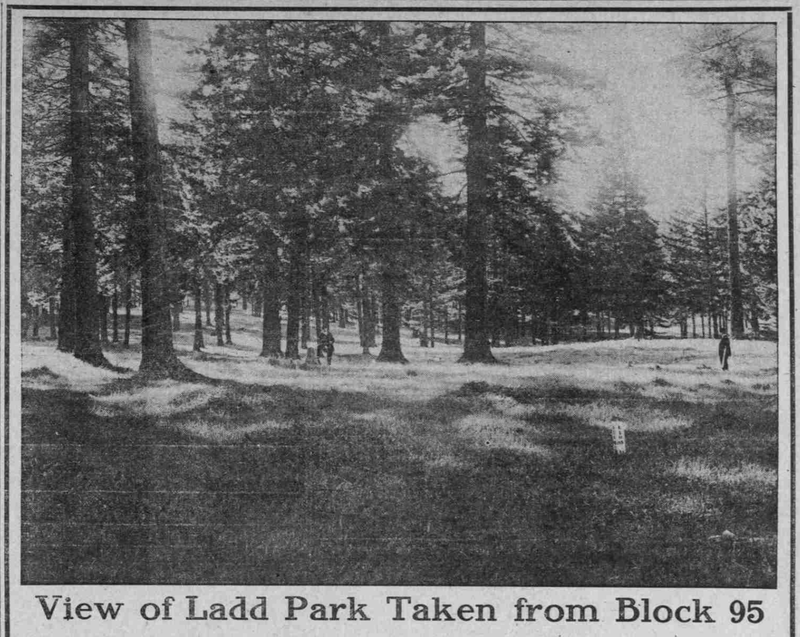 It is set forth that the city bought and paid a round price for the park and is under no obligation to perpetuate the name of Ladd, or that of anyone who did not make a donation. Secretary Walker explained yesterday that the club desires to retain Sunnyside as the name of the school and park. J.N. Davis, E.D. Curtis and Dr. J.A. Pettit were appointed a special committee to go before the Park Board and uphold the protest. 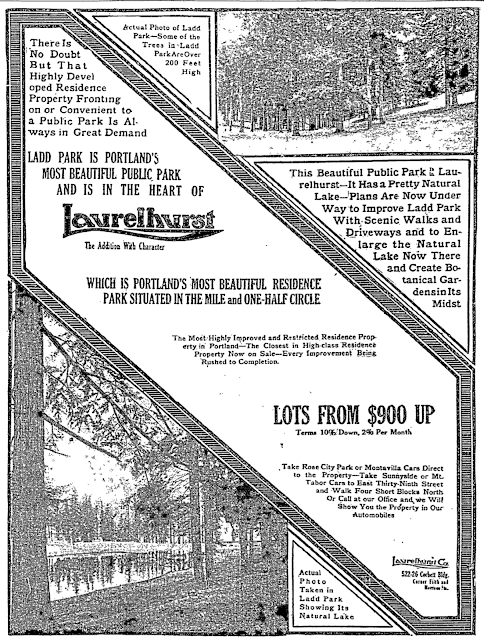 Citizens of Sunnyside want East 34th Street opened direct into the park and East Stark street, which cannot be done if the present plat of Laurelhurst is accepted by the City engineer. In the plat East 34th Street is closed. According to the plat the blocks fronting on East Stark Street double those on the south side in length. It has taken me a while to read the Laurelhurst posts, but they are quite interesting. I lived in Portland for 30 years and 10 years ago moved to NE Alabama. I was wondering if the old people's home was actually built. If so, does it still stand? Thanks for making this history more accessible. Yes, the home was built. I'll have another post in a few days with the articles and photos that I found. It is no longer a retirement home. It's now some sort of yoga center, called "The Movement Center."